Add the cashews, garlic, basil leaves, parmesan and chili in the food processor and pulse until finely chopped. While the food processor is running, slowly add the oil in a thin steady stream until well combined. Occasionally stop to scrape down the sides of the food processor if you need to. Top with oil and store in an airtight container in the fridge for 1 week, or you can freeze it for up to 6 months. Toss with pasta, dollop over baked potatoes, meat or fish, or spread onto toasted bread. Put a few basil clippings with about 10cm stems in a glass of water and place it in a bright spot in your kitchen. When the roots are about 2 inches long, you can plant them in pots. Pour or spoon your pesto into ice cube trays and freeze. Pop out the cubes and transfer them to freezer bags or containers. Each cube is approximately 1 tablespoon. Did you make this recipe? Please let me know in the comments below how it turned out. 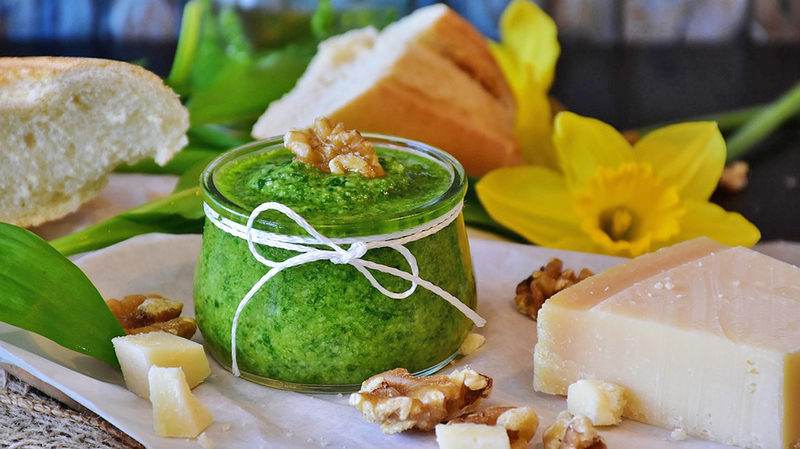 Basil pesto is one of my favourite recipes: it’s simply but very very tasty! I make it with nonna’s basil, and often I use almond and walnuts instead of traditional pines! You can try to eat pesto also on toasted bread with some fresh cheese, like stracchino: it’s AMAZING! I love basil. This looks like a simple delicious recipe. Love it! so simple! Will try soon!